For example; when the buyers went to the Loans Officer at CUB to apply for a mortgage in December she told them they don’t usually do mortgages in December, only car loans. And this certainly seemed to be the case when they returned in mid-January some five weeks later only to discover their application hadn’t even been presented. They actually missed TWO – not just one but TWO – completion deadlines. Said Loans Officer was twice out of office even though the buyers had an appointment to see her and when her stand-in picked up the file they could see it was incomplete. She seemed to think the buyers had some sort of ESP which enabled them to know which documents they needed to prepare/sign/present without ever telling them. Documents such as the confirmation that they lived together. 😂 They’re a married couple. And proof that his salary would be paid into his bank account. It has been paid in every month for the last eight and a half years. and the attitude of CUB towards their customers leaves much to be desired. I’m afraid, from what I heard, they wouldn’t know customer service if it jumped up and bit them on the backside. Not that everything was plain sailing on my side. My wonderful attorney Ms Lisa John-Weste worked so hard to complete on my behalf. Lisa is the wife of the no-less wonderful Loy Weste, the attorney who represented me in the High Court to obtain payment for my work on Paradise View when HAMA Film and TV wouldn’t pay up. Lisa had presented the paperwork for my Certificate of Compliance to the Attorney General’s Office. Unfortunately, Gaston Browne in his wisdom then called a General Election so the AG was on the campaign trail for three weeks and was out of office. As soon as the Election was over Lisa called the office daily until they finally admitted to her they had “mislaid” the paperwork. They couldn’t have said that a bit sooner? So, she immediately emailed the paperwork to them again, only for the server to crash. In the end she physically took the paperwork herself. And once we had completed she promised me she would process the money as quickly as possible and she did. I find it hard to believe that a bank like CUB, which prides itself on being a ‘young and modern bank’ according to its Mission Statement, would actually issue a cheque and not transfer the money electronically, nah? Anyway, Lisa was as good as her word and she instructed her chambers’ bank to process my money as a priorty, which they did. 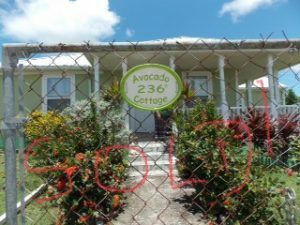 And so – I no longer own Avocado Cottage. But – I do not think with sadness that it is no more but rather with gladness that it was. I owned it for ten wonderful years. It brought me a lot of problems, but it gave me a lot of pleasure and wonderful memories which nobody can take away. As they say in Spain, ¿Quién te quita lo bailado? The literal translation is Who can take away what you’ve danced? Meaning, what you’ve lived and experienced is yours forever. But owning a house in Antigua was Then. And this is Now. Your life changes; things move on and nothing is cast in stone for ever. And I can hear you all asking – What about the Fella Who’s Far Away? Well, we will always love each other. We’re not sixteen with rose-coloured glasses; we’re big people. I tried living in Antigua, but it wasn’t for me to live there full-time. I love the place and will always go back for holidays, but I can’t live there permanently. And he is far too West Indian to move to England. So, we’ll keep in touch – thank God for WhatsApp which enables us to speak and message daily – and see each other whenever we can. And we’ll always remain friends. And to celebrate the sale I had a wonderful long weekend in Ibiza with the Daughter, which was just what the doctor ordered. Four heavenly days together – magic! And now to sort out the disgusting mess that my house in Dagenham was left in. The laughingly-called management agents, Anisten Homes, must have done the inspections with their eyes closed and a peg on their noses. I want to make it ‘home’ again. And that together with the next chapter of my life starts NOW! This entry was posted in Journal of Elaine Spires and tagged Anisten Homes, Avocado Cottage, CUB, Gaston Brown, HAMA Productions, Ibiza, Lisa John-Weste, Loy Weste, Paradise View by Elaine Spires. Bookmark the permalink.